I attended my first ever cookie exchange on Monday evening and took peppermint meringues as my offering. I made the recipe as is and mixed in some crushed peppermint candies (my new go-to ingredient) right before piping them onto the parchment paper. What a brilliant idea a cookie exchange is! You make one kind of cookie to share and come home with tons of different cookies to try. It's a genius plan. Other than that, I haven't done any holiday baking. Kind of sad really. I need to do some sort of holiday baking or the universe will be off-kilter n' stuff. Two things: 1. I need to make peppermint meringues ASAP. 2. I need to restock my freezer. 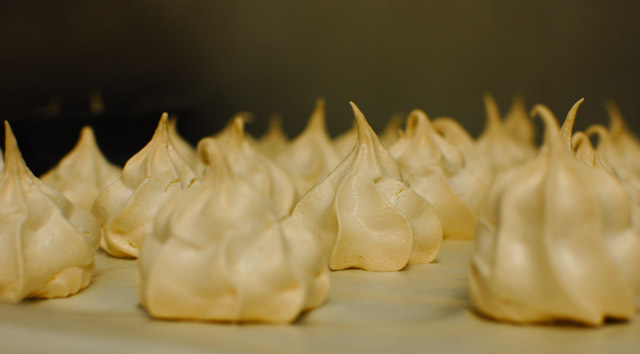 I think I'll make the meringues first! I just love meringues, I could eat the whole plate full. Your recipe looks awesome! Thank you so much for sharing with Full Plate Thursday. I am wishing you and your family a very Merry Christmas!